Four friends travel to Cumberland County, NC — posterchild for voter suppression in 2016 — intent on proving that the big idea of American democracy can be defended by small acts of individual citizens. In 2013, in Shelby County v. Holder, the Supreme Court invalidates the part of the 1965 Voting Rights Act requiring certain states to submit changes in voting laws to the Justice Department for approval. Almost immediately, certain states take voter suppression measures such as enacting voter ID laws, redrawing district boundaries, and repealing same-day registration. Three months before the 2016 election, a group of volunteers across the country mobilizes to work on voter protection - to observe elections and to assure that all those who wish to vote are legally allowed to do so. Laverne Berry, Steven Miller, and Claire Wright head to North Carolina. What they find at the polls serves as both a warning and a call to action for anyone interested in protecting the "One Man, One Vote" fundamental of our democracy. Dealing with themes that are constantly sensationalized and manipulated by the media - Left vs. Right, North vs. South, Black vs. White - CAPTURING THE FLAG offers instead deeply personal, often surprising perspectives on the 2016 Presidential Election and its aftermath. "A film every young adult needs to see. At a time when people across the nation are wondering how they can make a difference, this film says, yes, you can - here are some steps you can take." "Capturing the Flag shows personal stories on how voter suppression can affect anyone of any age, race/ethnicity, or gender. There is no way you can't see a family member or friend in the experiences of the voters highlighted...The future of our democracy is dependent on us fighting all forms of voter suppression and making sure that every person gets to cast a ballot." 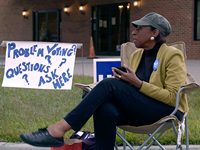 "In addition to covering numerous ways voting has been restricted, the film provides the invaluable service of demonstrating how ongoing confusion about just what the voting law even is in certain states is contributing to the problem of voter suppression. The film offers an intimate portrayal of concerned citizens who, as volunteers and activists, are fighting in the face of the altered legal landscape to secure the most fundamental right of democracy - the right to vote." "Capturing the Flag reveals the unglamorous role of activists who volunteer their time to do the nitty-gritty work of assisting regular people struggling through the voting process. Students and civic groups will be motivated by the film's central characters to step up their involvement in future elections." "The stories of these voters remind us that the heart of this fight is our shared human stake in our democracy - and Capturing The Flag serves both as a warning and a call to action to activists across the country who are ready to fiercely defend it." "Capturing the Flag tells the modern story of voter suppression practices in vivid detail. It helps make sense of the continuing fight, which dates back to the founding of our country, to extend and protect the right to vote. The documentary will be required viewing in my voting rights class." "Capturing the Flag tells the story of four friends awakening to the contemporary assault on democracy, and discovering their own capacity to do something about it. The film is a good primer in citizen action that can be used to start a conversation among concerned citizens, from students to seniors, about what can be done and how we all can get involved in election protection work." "Capturing the Flag captures many key elements of the dynamics of voter suppression and its implementation in North Carolina. And it reveals the subversive, anti-American qualities of voter suppression in an effective, personalized way." "An unbiased story that every American should see...Capturing The Flag demonstrates that democracy at its very core is continually being challenged." "I can read about voter suppression and hear about voter suppression, but seeing it unfold on screen is staggering in an entirely different way." "A microcosm of the passions, absurdities and contradictions of the U.S. election system...Director Anne de Mare's fascinating and sober documentary fights an undercurrent of foregone conclusion, but provides pointed insights into our election system and the soldiers who take up the challenges of making votes count." "An important film to watch!" "The subtlety with which this kind of suppression happens is significant. It's not as stark as a poll tax or a literacy test. It's a lot of little things that can add up to a big thing." "This documentary captures the human consequences of legislative changes which embody the cutting edge of aggressive voter suppression efforts at the state level. In addition to illustrating the impact of voter registration purges, the overall complexity, confusion, and hassle of the voting process for some voters is revealed. An excellent tool for illustrating multiple levels of problems with the current structure and the laws governing our elections." "A fascinating examination of the 2016 election at the local level...I spent many hours that fall registering voters and taking them to the polls in Durham County. Capturing the Flag is a compelling evocation of the challenges faced by all of those working to guarantee the right to vote."